Why Replacing Missing Teeth is so Important! Did you know in the United Stated 1 in 4 people over the age of 65 have lost all their teeth? It’s mostly caused by gum disease, tooth decay and sometimes injury. It’s important to take care of your teeth because each tooth plays a vital role. Your teeth help you chew your food, speak clearly and of course show off your smile! When you lose your teeth and don’t replace them it can change the whole structure of your mouth, changing your appearance for the worse. Losing more than one tooth can cause your bite to shift onto your other teeth and over time will shift your teeth into where the missing teeth were. Not only will your teeth shift, but it will also be easier for plaque to build up in those missing spots which can result in gum infections that will lead to more missing teeth. Luckily, for you Philadelphia Dentistry has teeth replacement options so you can have an all-natural looking smile that you are proud to show off. At Philadelphia Dentistry we offer several different options such as, implants, fixed bridges, full dentures and removable partial dentures. When you come in for your free new patient consultation one of our experienced doctors will give you a free exam and let you know which option, they think is best for your specific case. 1. Dental implants. 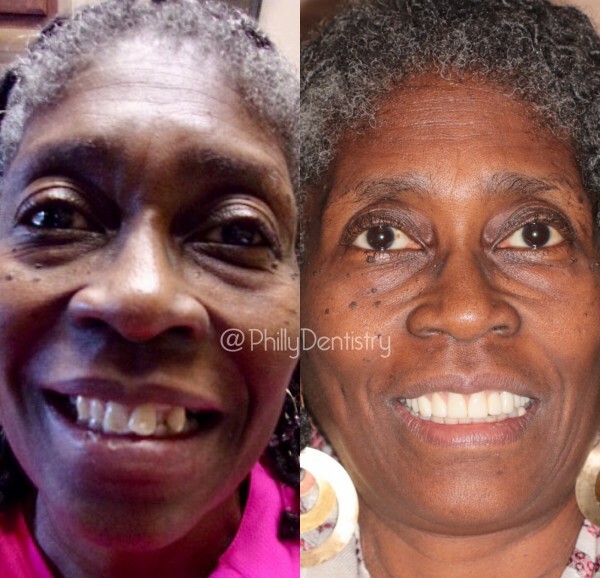 Dental implants are a very popular option at Philly Dentistry for replacing missing teeth. Implants look and feel like your own teeth because we make sure we pick the best option that matches your natural teeth. Typically, implants are best used for replacing a single tooth, but can also be used to replace several teeth. The implant is a small titanium post that goes into the bone socket of the missing tooth and then the new tooth is securely placed on the post to give you a natural look so you can smile proud again. 2. Fixed bridges. Bridges are typically used to replace several missing teeth and are supported by implants or the teeth surrounding the gap. They are made from metal that is covered in porcelain and will give you a great natural smile. 3. Full Dentures. Known as conventional dentures they are an entire set of artificial upper and lower teeth. They are held in place by suction and may feel a bit awkward at first, but once you get used to wearing them you won’t even notice anything. 4. Removable partial dentures. Partial dentures are used to replace a limited number of teeth which are attached to a plastic base supported by the gums and your remaining teeth. These partial dentures can be taken out for cleaning and are usually less expensive than implants or bridges. 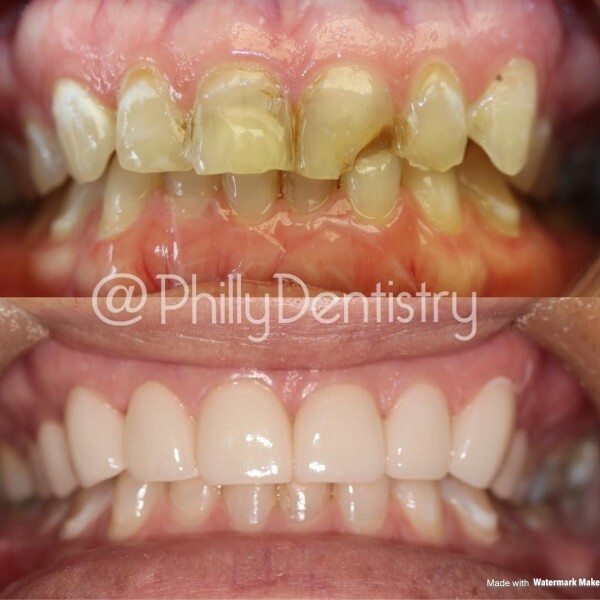 At Philly Dentistry our goal is to help Philly smile more, one patient at a time. If you have missing teeth or end up losing a tooth, have no fear because we have all the options to help you get that beautiful smile back. Don’t hesitate to call us today and schedule a free new patient consultation 215-568-6222. If you haven’t been to the dentist in some time there is a good chance you may be having some pain either from broken or damaged teeth. 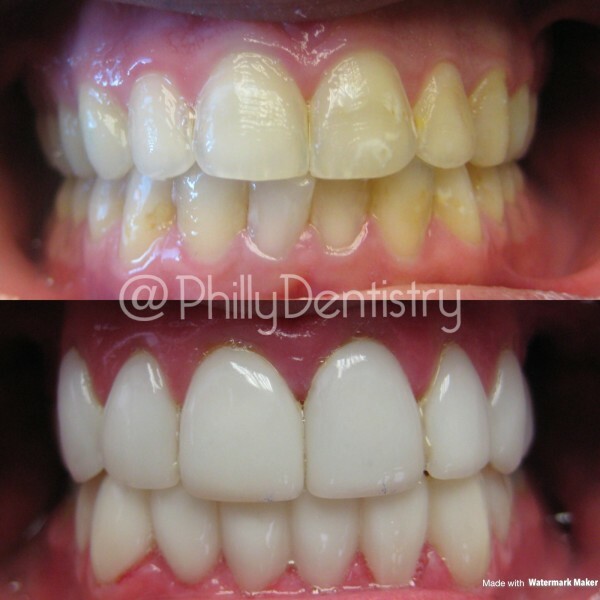 At Philadelphia Dentistry, we can help you get out of pain and get that smile you always wanted. Restorative dentistry gives you back that natural looking smile and heals any dental health problems you may be having in a comfortable, relaxing atmosphere. 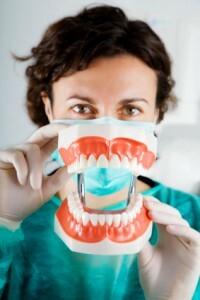 At Philly Dentistry we offer many restorative services to our patients. One of the most popular services is dental implants. Dental implants are the perfect solution for any patient that has missing teeth, but doesn’t want the hassle of getting dentures. Another great service we offer is dental crowns. If your teeth are cracked and you do nothing about it a much more serious problem can occur. When your tooth is cracked or chipped it exposes the tooth to harmful bacteria and plaque that will infect the tooth. A dental crown is placed over the broken tooth to restore it back to new so no farther problems will occur. This solution will save your tooth and give you a natural looking smile. Similar, to dental implants are dental bridges which are excellent for missing teeth. How a dental bridge works is that the crowns are attached to your teeth on either side of the missing tooth area which allows them to acts as an anchor for the bridge and then topped with a prosthetic tooth. If you are experiencing any problems with your teeth, please give us a call at 215-568-6222 and we will help you achieve your best smile! If your teeth are weak, chipped, cracked, fractured, decayed, aged, discolored or misshaped then you are a perfect candidate for dental crowns. What exactly is a dental crown? Dental crowns are strong natural looking dental solutions that are used to seal a tooth after a root canal procedure. When your teeth are badly damaged you develop more of a risk for bacteria to travel through your mouth because chipped and cracked teeth create easy paths for plaque and harmful bacteria to move around. Do not wait if you are experiencing any oral health problems because the longer you wait the worse it will become and will result in either a root canal or even a tooth extraction. 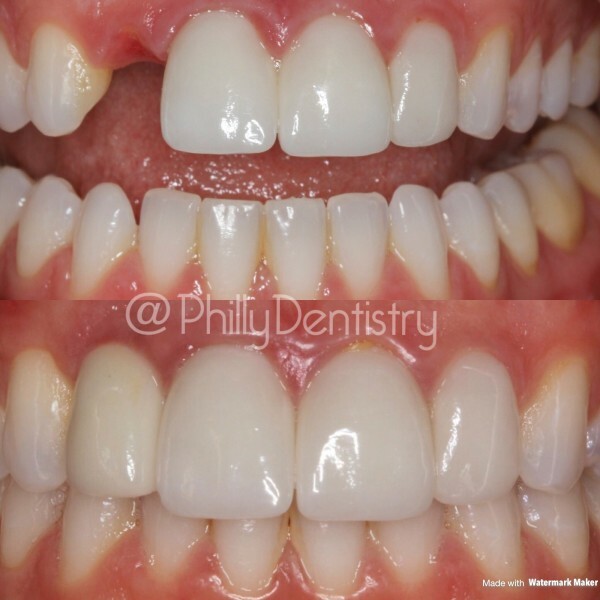 The benefits of dental crowns are great, especially at Philadelphia Dentistry where our doctors use the latest advanced dental technology to create and bond dental crowns. The number one benefit of dental crowns and most importantly is to relieve any discomfort you may be experiencing from your damaged teeth by placing a crown on the tooth to protect it against any future damage and prevent any sensitivity. Many times, people assume getting dental crowns is a complex procedure that takes an immense amount of time. In fact, it is actually straightforward. Once the enamel of your teeth is clean and healthy one of our accomplished doctors will shape your tooth. This shaping of your tooth allows it to firmly hold the crown. After our doctors take an impression of the tooth it is then sent over to our trusted lab where expert technicians will create your custom crown. Once the crown is ready Dr. Cirka, Dr. Meier, or Dr. Jeon will place it over your tooth with the best bonding cement money can buy. Dental crowns are custom made specifically for your smile. You’ll feel confident when your crown is made to the shape, color, fit, and size that matches your smile for an all-natural look. Another benefit is that dental crowns can enhance the appearance of your teeth. Since the crown actually goes over the tooth it can instantly fix problems such as, discoloration, misshapen teeth, chips, fractures, crookedness, and much more. These problems can be fixed promptly and look 100% natural which is why some people tend to get crowns just for the appearance much like porcelain veneers. With the proper care such as, brushing, flossing, and routine checkups and cleanings your dental crowns can last for decades, typically 10-20 years sometimes 30 years. The porcelain material that the crown is made of is extremely strong and durable and will protect your tooth from any future re-treatments. If you are experiencing any type of discomfort in your oral health and think that a dental crown or crowns could be the right fit for you, give us a call today at 215-568-6222 and if you’re a new patient you’ll receive a free consultation that includes an exam and cavity detection X-Rays.